LOVE my new wallet from Pixie Mood ! 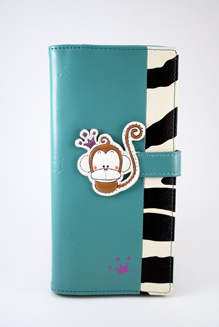 A great Canadian company, Pixie Mood makes long and short style wallets as well as coin purses. These faux leather wallets come in a variety of bright colors and patterns to match your funky fashion sense. I had received the Matty Long Wallet in blue and the bright color and zebra stripe along the side make this a fun accessory I can't wait to show off! The wallets are super roomy with enough room for 12 cards plus a clear windowed area for ID. The wallets also have a large zippered compartment for coins and a long slot for bills and cheques. A magnetic closure on the front of the wallet ensures that everything stays inside where it's supposed to! I almost couldn't decide which I liked more; the wallet or the box it came in! Pixie Mood wallets come packaged in a super-cute gift box, which makes it even easier for you to give as a gift to all of your friends! Pixie Mood wants everyone to get excited about their wallets and has gratefully offered to give away your choice of an item on their web site. Open to USA or Canada. Giveaway will be drawn by Random.org on July 18,2011. Tell me which is your favorite item on their web site. Like them on Facebook and get an extra entry into their monthly draw! I think my favourite is the Matty Long Wallet - Yellow. Which is odd, because I don't normally like yellow stuff. But this is just super cute and funky. I like the Sakura Long Wallet in Black. My fav item is the Matty Long Wallet - Black. Adore the Sakura short wallet in green. Like Pixie Mood on facebook. My favorite item is the Sakura Long Wallet - Black :) *Thanks* for the giveaway! I like the Sakura Short Wallet - (Pink for my daughter, but I would like the black for me). I like the Shakura long wallet in green! Following via GFC as amybrown16.